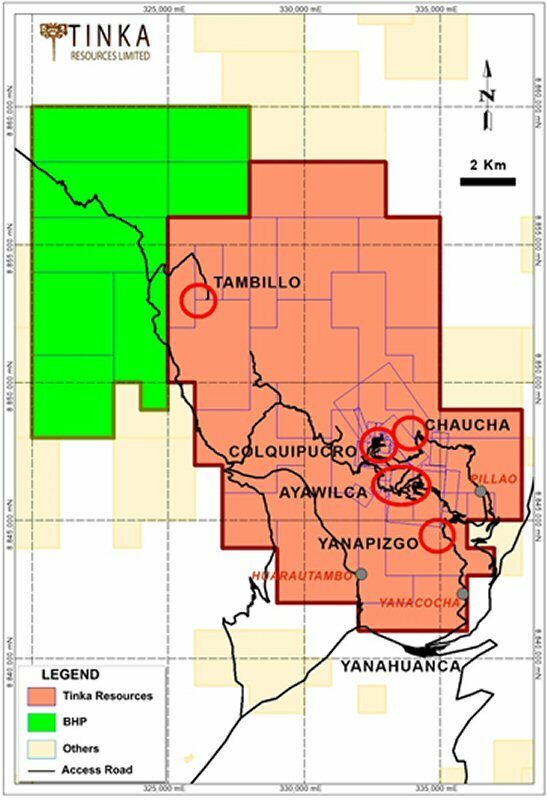 Tinka Resources Limited ("Tinka" or the "Company") is pleased to provide an update of its exploration activities at the Company's 100%-owned Ayawilca project in central Peru. A helicopter-borne magnetic geophysical survey has now commenced, to cover the full 150 km2 of contiguous mineral claims owned by Tinka, with the purpose of identifying new areas prospective for base metal mineralization. Mineral claims and known prospect areas to be covered by the current airborne survey are shown in Figure 1. Dr. Graham Carman, Tinka's President and CEO, stated: "For some time, Tinka geologists have realized that the zinc, tin, and silver mineral resources discovered to date at Ayawilca are part of a mineralized district, which continues to grow as drilling advances. The zones of base metal mineralization so far discovered are, in part, associated with magnetic anomalies that have no surface expression. The magnetic anomalies lie beneath a 'cap' of unmineralized sandstone, a rock formation which outcrops extensively throughout the property. We believe the airborne magnetic survey will help identify new prospective areas for base metals beneath the sandstone, as well as put our existing mineral resources into a regional context, and provide Tinka with a powerful exploration tool." To view the map associated with this news release, please visit: http://www.marketwire.com/library/20160627-fig1.jpg.